8 differnt ways to select and replace a colour. so I decided to experiment with different algorithms. I have also included a 'blend' slider to soften the replaced colour. Tip: It's easiest to use the ink dropper tool to select the desired detection colour before running the plugin. Here's the codelab code if you want to play with the algorithms! t1b = t1 * 255;// t1 byte, from 0 to 255 but a double for easier maths! Color col = cp.ToColor();// from Boltbait's tutorial part4 - thanks BB! Thank you Red ochre. Being able to play with different algorithms in addition to colour tolerance will certainly make life easier for a lot of users. The "keep unaltered" selection option is brilliant too. Well, this is just cool! Recolor doesn't always work the way I want but this does. And I can get neat effects when I play with the tolerance and transparency. This will be useful, great plug-in redochre many thanks for your on going developing. I'm glad you're finding it useful. Writing plugins is addictive you know! - On the top of the window, next to the RGB values, put the HSV values. 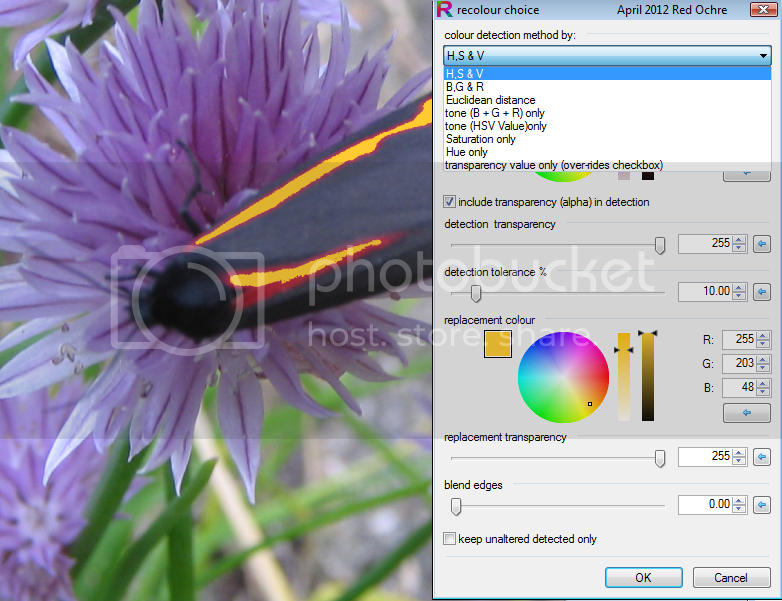 (like in the Paint.NET color picker windows) so that the user can see both values (RGB and HSV). Hello Origami, welcome to the forum. The color picker is generated by 'codelab' and is standard. It would be great if it offered the less/more option (showing HSV and alpha) like the main color window, but sadly it does'nt. A similar window could be created using Visual studio, but unfortunately that's too hard to use (for a simpleton like myself anyway). The other suggestion for seperate sliders for Hue, Saturation and Value, with corresponding integer tolerance sliders would be possible but would ideally be 'linked' to the BGR values (again something that can only be done in Visual studio). Also adding 6 more sliders would make the interface massive. So I won't be changing this plugin. It would however be relatively easy to create a simpler plugin that only does the specific task you described (using codelab). Probably easiest to have one plugin just for HSV and another just for BGR. eg/ 3 HSV sliders, 3 tolerance sliders, a BGR color picker for the replacement colour? - or use the secondary color as replacement (easiest)? - or 3 HSV sliders and a transparency slider for the replacement? I have included the codelab code above and I'd like to encourage you to download codelab and have a go at altering my code to suit your needs. Read BoltBait's tutorials first and see how you get on. If you really need this, and I get the time, I'll see what Santa can do.